AUSTIN, TX – August 30, 2016 – The vision for Goodnight, a mixed-use community in southeast Austin, continues to take shape as construction crews break ground on the first phase of residential development this summer. Bordering Onion Creek Metropolitan Park just nine miles from downtown Austin, Goodnight occupies 700-acres in the heart of the growing southeastern part of town along Slaughter Lane. Planned as a vibrant urban hub with unique public parks and cultural attractions, the first phase of the neighborhood will include a diverse array of residences from AVI Homes, Centerra Homes, and M/I Homes. Goodnight’s dense streets, neighborhood parks, and well-proportioned homes embody a New Urbanist approach to residential development, while incorporating the design and functionality of classic Austin neighborhoods. The first phase of the community will feature 104 single-family homes, nine duplexes, and a 90-unit town home complex bordered by Charles Merle Drive, Vertex Boulevard, Slaughter Lane, and Slater Drive. Home design elements include three different architectural styles that will be implemented across all residences: Contemporary, Hill Country, and Traditional. Foundations on the first homes are being poured this summer, with projected move-in dates ranging from late-2016 to mid-2017. 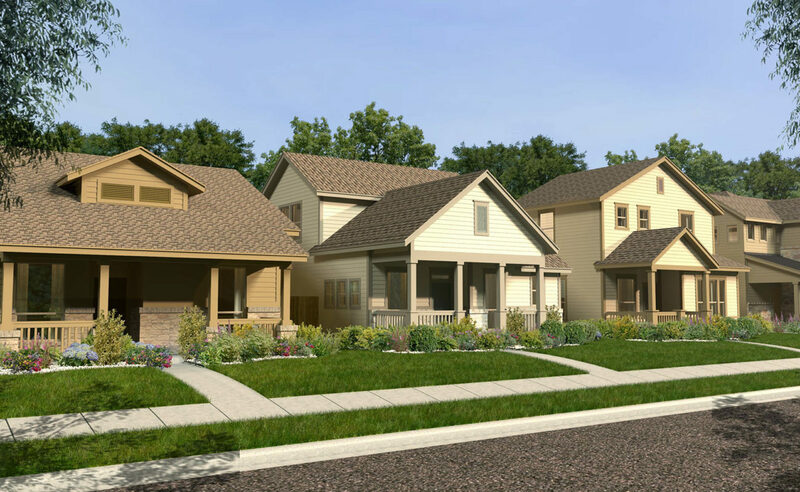 58 single-family homes from Centerra Homes ranging from 1,500 to 2,200 square feet on 37-foot lots. Homes starting from the $240,000s. 46 single-family homes from M/I Homes ranging from 1,700 to 2,700 square feet on 45-foot lots. Homes starting from the $260,000s. 9 duplexes (comprised of 18 units) from AVI Homes on 55-foot lots. Units starting from the $220,000s. Additionally, AVI Homes will build an approximately 90-unit town home complex. Project construction will begin in 2017 on affordably priced two and three bedroom units designed for first time or move-up home buyers. 35-acres of community trails and expansive green space, designed and developed by TBG Partners. Goodnight’s build out is being overseen by Austin Goodnight Ranch, a collaboration between members of the Goodnight family, who have owned the land since the 1960s, and Benchmark Development. Residents of Goodnight will enjoy a tranquil neighborhood that offers unrivaled access to the outdoors. In the coming months, work will start on the first of many pocket parks. The creation of a Park District in Goodnight will fund the redevelopment and continued maintenance of Onion Creek Metropolitan Park just north of the neighborhood’s borders. Plans include 30-acres of designated great lawn (larger than the size of Zilker Park’s lawn), 20-acres for native space, and supported parking. Construction is set to start by 2018. Goodnight will see the addition of many shops, restaurants, and other conveniences as the community continues to evolve. Once completed, Goodnight will be comprised of approximately 3,500 homes, 226,000 square feet of commercial and office space, and two public schools, all carefully planned around 120 acres of public open space. A large 3-mile hike and bike trail will weave throughout the neighborhood and connect to Onion Creek Metro Park. Key transportation investments are underway in the area as well, including the expansion of Slaughter Lane to Vertex Boulevard. AVI Homes has been designing and building award-winning homes since 1978, and has been building high quality, Energy Star Certified homes in the Austin area for 10 years. AVI Homes has developed a smarter approach to the entire building process; one that puts the customer at the center of everything. We mean what we say, deliver what we promise – we build the perfect home for you. An award-winning homebuilder, Centerra Homes was founded in Austin, Texas in 2009 by homebuilding veterans with more than 50 years of combined building experience. Centerra Homes builds quality, high-performance, sustainable, and energy-efficient homes in the most premier communities in Austin and San Antonio. The Centerra Homes mission is to build each and every home as if they are building it for their own families. M/I Homes, Inc.is one of the nation’s leading builders of quality single-family homes, having delivered nearly 100,000 homes since its foundation in 1976. The company’s innovative, award-winning homes are marketed and sold under the trade names M/I Homes and Showcase Homes. The Company has homebuilding operations in Houston, Austin, San Antonio and Dallas/Fort Worth in Texas; Chicago, Illinois, Columbus and Cincinnati, Ohio; Indianapolis, Indiana; Minneapolis/St. Paul, Minnesota; Tampa, Sarasota and Orlando, Florida; Charlotte and Raleigh, North Carolina; Virginia and Maryland suburbs of Washington, D.C.
Goodnight is a mixed-use neighborhood set to transform a former ranch in southeast Austin into a vibrant, walkable, tree-lined urban hub. The 700-acre site will be developed over 10 to 15 years and is expected to include up to 3,500 homes; a mixed-use town center; sites for two Austin Independent School District schools; 226,000 square feet of retail space; more than 120 acres of open space; and landscaped streets designed to integrate a safe network of bike paths, trails and sidewalks. The first phase of the project, the northeast quadrant, is adjacent to Slaughter Lane and includes a mixture of single-family homes and condominiums, a community park, and Blazier Elementary School. For more information, visit www.liveatgoodnight.com.